Just saw a post on the next Revit release and things look promising! 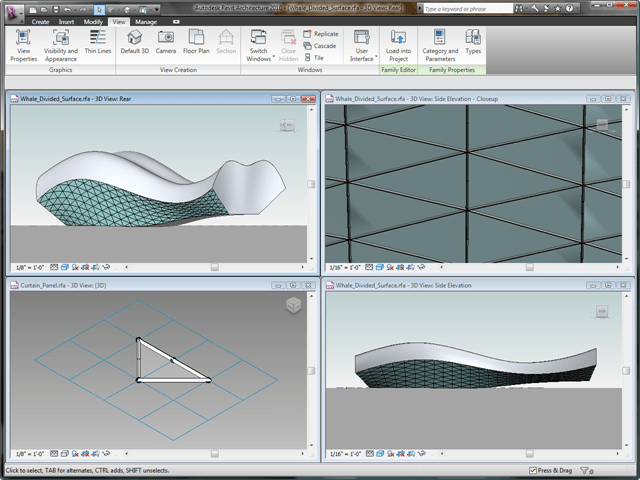 Revit will apparently look more like Rhino (background gradients etc.) and will also get better 3D modeling capabilities. Even a paneling tool will be included (see image above). For the rest, read the post at Revit ArchCenter. You can find some more reviews at AEC Bytes or here. I guess, my only frustration will be the horizontal toolbar ribbon again that now finally killed the admittedly a bit outdated Revit user interface. You can see a video overview of the ribbon here. Consistent with their annual software release cycle, we will still have to wait until April for this new version. Drafting, anyone? IMSI’s free DoubleCAD may be a good pick.